I’m so excited that this dish turned out so well. When you’re cooking for a lot of people (ie, my family), there’s a lot of pressure to make something that tastes awesome. So when you’re experimenting, plus trying to create something that’s healthy as well as yummy, the pressure can really build. I’m going to warn you readers…the prep work on this takes a long time. But once you’ve got the list below accumulated, the meal will come together very fast. I think trimming the beef off the bone and cutting away the fat took the longest. But I was very thorough in order to produce a healthy meal. If it’s important to you, it’s worth the time spent. And vice versa, of course. This dish will take a very large wok or skillet to make. If you don’t have one, you can still pull this off. I had a medium wok, and I just had to make a few tweaks. For one, when sautéing the vegetables, I covered them for a few minutes so that they’d shrink up a bit. They were much easier to work with that way. I also cooked the green beans separately. I put them in a microwave safe bowl, added a bit of water (about ¼ a cup), and microwaved them for 3 minutes. Then, when the mushrooms and onions were close to finished in the wok, I threw in the green beans so that they’d soak up some of the sauce (ie flavor). That ended up working very well. In a large pot, bring cups of water to a boil. In the meantime, heat oil in a large wok or skillet over high heat. Add the beef and toss with paprika, salt, and pepper. Sauté the beef in an even layer for 4-6 minutes, stirring occasionally and browning on all sides. Move to a separate plate and cover, leaving the juices in the wok. Add the onion, mushrooms, and green beans to the wok and sauté until vegetables are tender, about 11-13 minutes, stirring occasionally. Meanwhile, pour the noodles into the pot of boiling water and cook for 8 minutes. Then drain in a colander, leaving the noodles out of the pot. When the vegetables are sautéed to tender, add the thyme and cook for 1 minute longer. Then transfer to the now-empty pot removed from heat, again leaving the juices in the wok. Add the beef to the vegetables and cover to keep warm. Combine the wine and juices in the wok and cook down over high heat for 10 minutes. Add the noodles and stir until evenly coated. 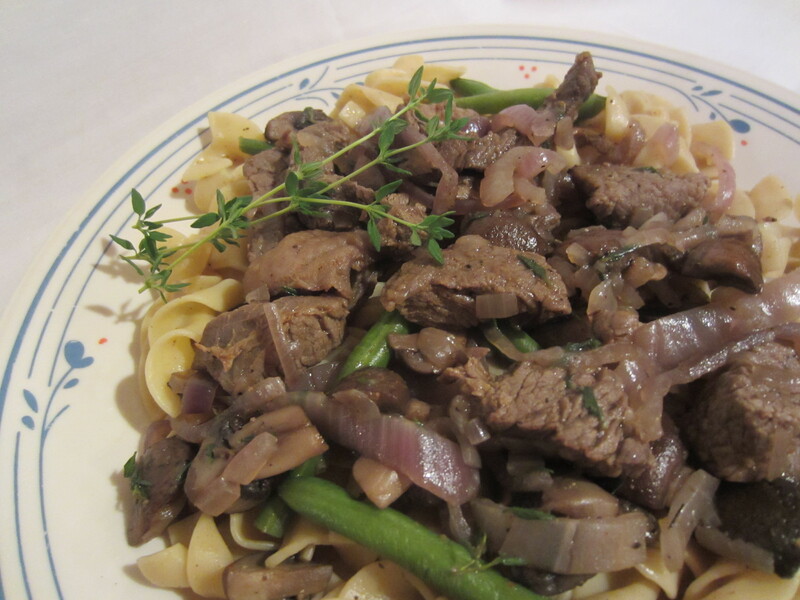 Immediately serve the beef and vegetables on a bed of noodles, with an optional sprig of thyme for a garnish. Anything that combines wine as ingredient has got to be ace. Sounds yummy Kathleen!! But the sour cream sauce is what I loved from the unhealthy recipe!!! I know I am so bad!!! Thanks for the new healthy recipe…I will have to try it!! Previous Previous post: Is That A Real Baby?